The integrated blades Gillette Venus follow behind the epilator, capturing stubborn hairs and lifting away dead skin cells to reveal a fresh new skin feeling every time. The features of the Silk-épil 7 Dual Epilator are dermatologically recommended by Dr. med. Petra Staubach (University Skin Clinic, Mainz) as the gentle solution to long-lasting hair removal thanks to its unique combination of skin-soothing features. 1. Dual Epilator with Gillette Venus technology: The unique combination of Braun’s most advanced epilation technology, together with Gillette Venus technology makes epilation more thorough than ever before. Braun’s technology and the integrated blades remove hair in just one stroke to reveal a new skin feeling that lasts. 2. Pivoting head: The Silk-épil 7 Dual Epilator features a flexible head that can pivot by up to 15 degrees forward and back. This means it can better adapt to the contours of the body for more comfort and maximum thoroughness. And it ensures that optimum usage position is maintained. 3. SoftLift Tips: The SoftLift Tips effectively lift even flat-lying hair and help guide them to the tweezers for removal. 4. Smartlight: The Smartlight helps easily guide your way through the epilation process and lightens up even the finest hairs for no miss removal. 5. Speed personalisation: You can select the right speed for your individual needs: Speed one for extra gentle epilation, speed two for extra efficient epilation. The Silk-épil 7 Dual was designed specifically for epilation in warm water. Warm water is relaxing and soothing. The warmth improves your circulation and increase the comfort of your experience while making your skin less sensitive. Braun’s technological breakthrough makes epilating more efficient than ever before. 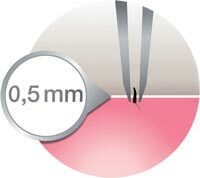 The 40 tweezers have been engineered to close at the optimal angle and grip hair even closer to the skin for better removal of even the shortest hairs (0.5 mm). The Silk-épil 7 Dual Epilator gives you the freedom to epilate wherever and whenever desire d. Get up to 30 minutes of operation after just one hour of charging. All Silk-épil 7 Dual Epilator models have a sealed body, which means they can be both used a nd cleaned under running water for better hygiene. 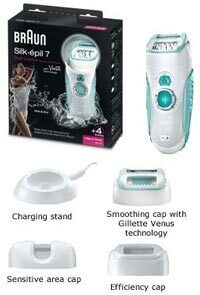 The Silk-épil 7 Dual Epilator 7891 also comes with four attachments including a charging stand, a smoothing cap with Gillette Venus technology, an efficiency cap and a cap for sensiti ve areas, specifically designed to give you superior results in different areas of the body.